I’m so excited to be heading to FIL Buenos Aires this year! So far the only thing on my schedule is my presentation on May 1st at 16:30, but I should have more information for you guys soon! I’ll be at the Barnes & Noble in Oak Park Mall on Saturday, February 9th, starting at 3:00 PM! Hope to see you there! Join me and the lovely Tamara Ireland Stone for a fun night at Kepler’s! You are welcome to bring your books from home, but I would ask you to consider purchasing something from the store to help support their future events. Please note that the in store event at Little Shop of Stories is signing-only! I have to leave for the airport right at 6 PM but I would love to say hi and sign your books! This event is with Tamara Ireland Stone, author of Click'd and Swap'd and many other fabulous books! 6 p.m. to 6:50 p.m. Book signing in the international area of the fair. LET’S TALK BOOKS & BISCUITS! Stop by for biscuits from Callie’s Hot Little Biscuit and a chance to meet your favorite Disney authors Alexandra Bracken (The Darkest Minds), Dhonielle Clayton (The Belles), Roshani Chokshi (Aru Shah and the End of Time), J.C. Cervantes (The Storm Runner), and Corrie Wang (The Takedown). Come in your best cosplay to hear these authors talk about what they’re fans of, and what it was like to discover they had fans of their own! Do they ever read fanfiction? Or write it? How many rom coms can they quote from memory? Were they Team Spike or Team Angel? Inquiring minds want to know! If you could pick one superpower, what would it be? We’re gonna go ahead and guess it’s probably not lightning hands, turning into a monster, or mind control. Spontaneously developing special abilities isn’t all it’s cracked up to be, and these authors will tell us all about it. Looking for a—wait for it—sweet treat the night before Halloween? 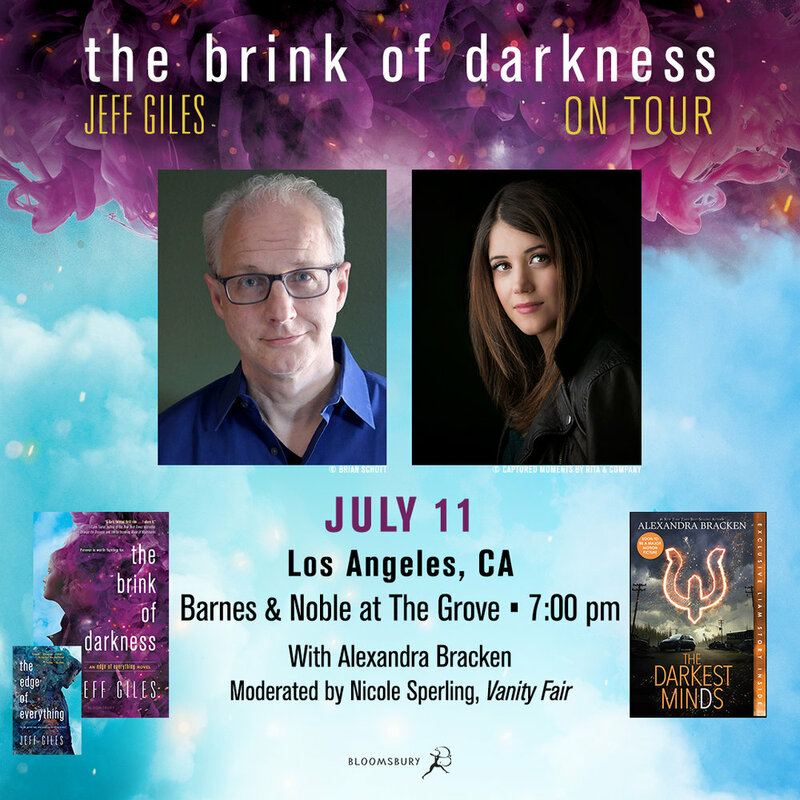 Suzanne and I are joining Jen to help launch her upcoming book, THE DARKEST STAR, and we would love to hang out with you! I’m so excited to head back to my alma mater, The College of William & Mary, for Homecoming! Writing masterclass with Anne Marie Pace--we'll be giving practical writing advice and talking about the book-to-film adaptation process. Click to reserve your ticket(s). Enjoy breakfast, hear from yours truly and Anne Marie, and get a book signed. The W&M Bookstore will have books available for purchase at a customer discount. Free and family friendly! I'll be signing copies of the TDM movie edition and TDL at Disney's booth (#2329). Feel free to bring your books from home! Panel time! Disney Publishing Presents: Let's Talk YA moderated by yours truly and featuring Liz Braswell, Serena Valentino, Dhonielle Clayton, and Christine Lynn Herman. You can find us in room 1A18. The 18th annual Library of Congress National Book Festival will be held at the Walter E. Washington Convention Center on Saturday, Sept. 1. The event is free and open to the public. NOTE: Visitors can expect enhanced safety and security measures when entering the Convention Center. The festival allows you to bring your books from home--I'm happy to sign whatever you bring with you! No tickets required but please consider purchasing something in store to support this wonderful indie. If you can't attend but would still like a signed, personalized copy, you can preorder the book here. This event includes a screening of The Darkest Minds! Secure your tickets here. Hi guys! I'm so thrilled to be coming back to YALLWest this year! This year will be extra special for me because there's going to be a ton of TDM-related things for you to see and participate in! As always, I'm happy to sign whatever you bring with you to the festival. However, please note that I might have to reduce the amount of books I'm signing to three if I start running out to time and have to head to the next panel. Director Jennifer Yuh Nelson will be joining me to talk about her career and about the upcoming TDM movie. We'll also have a VERY cool sneak peek to share with you! 😊 Seating at this event is first-come-first-served, so please try to arrive a little early if you can. We'll be celebrating the release of Sooz's SIGHTWITCH on Wednesday, February 21st at 7PM. You can find us at the Tempe location of Changing Hands--hope to see you guys there! I'll be back in my beloved Charleston for YALLFest 2017! Full schedule coming soon! Please join me for a discussion of my new book The Dreadful Tale of Prosper Redding as well as a signing! Please join me for a discussion of my new book, The Dreadful Tale of Prosper Redding, as well as a book signing! Please join NYT-bestselling author Tamara Ireland Stone and I for a Q&A on our new books and signing! Join me for a meet and greet and signing! Join me and NYT-bestselling author Tamara Ireland Stone for a discussion of our new books and a signing! Happy families are all alike, every cursed family is cursed in its own way. Whether it's a vindictive demon, familiar fairy tale characters intent on destruction, or a streak of familial bad luck caused by a creature of the swamp, the determined protagonists of Cassie Beasley's Tumble and Blue, Alexandra Bracken's The Dreadful Tale of Prosper Redding , and Michael Buckley's Sisters Grimm series are ready to change their fates. Every family has its problems, but it gets a lot more complicated when there's a curse involved! Join us for a madcap YA library takeover -- YALLWEST style! We'll be kicking off the festival weekend with a night of signings, tomfoolery, swag giveaways, food -- and life size video games. 3 PM: Signing in the Centennial Quad. Please note that this signing is wristbanded. You can grab a wristband at 2PM at the Wristband tent at the Centennial Quad. I'm happy to sign anything you bring with you and take pictures, but if we're running out of time I might have to limit to 3 books per person and we might not be able to do posed photos. Location: Barnum Hall - Grab your tickets here!